I have tons of subscriptions that require me to pay. Some merchants like Netflix, WSJ, DigitalOcean, iCloud and etc have me pay monthly, and others like Dropbox, GoDaddy Domain, Amazon Prime, Costco Membership charges me every year. With these services you subscribe become more and more, it is naturally very easy to lose track of your subscriptions and pay some unnecessary money before you realize and cancel it. So we thought - why not create a simple & lite web app that could be a central place to display all your subscriptions so that you know what you have to pay? 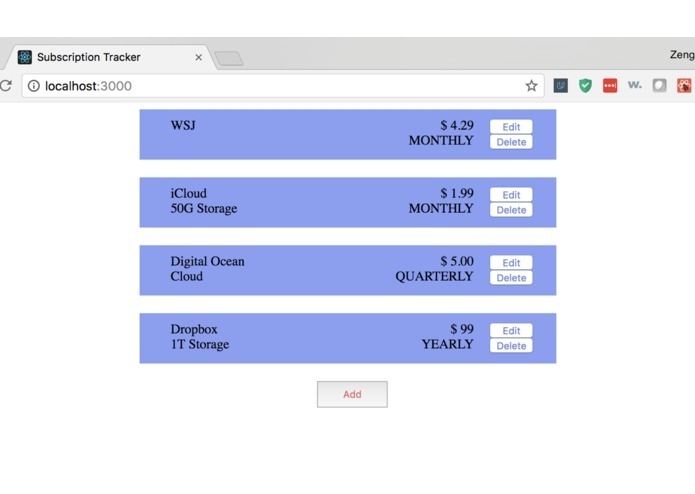 A web app that allows you to jot down, edit, and remove subscription entries! NodeJS/ExpressJS as server side enviroment and React + CSS as front-end technology. Setting up the environment and babel/webpack is a pain, and since we only have 2 people, time is a challenge too. Well, we got it working. It's not fancy, but it does its job! Tons of things about web development. Make it look nicer, and also add user login and cloud storage part. Since we have 2 people, we pretty much have just been pair-programming for the whole time.